SanDisk knew coming into 2011 that it would be facing headwinds. Three variables would be pressuring gross margins. Yen exchange rates, non-captive mix and Fab 5 start-up costs were expected to shave 7 to 9 points from product gross margins. 2010 product gross margin was a record 43%. Taking into account the headwinds, and a minimal boost from costs and pricing, early 2011 guidance called for product gross margin in the 35% to 38% range. Adding in license and royalty brought SanDisk’s total gross margin forecast up to the 39% to 42% range. This was before the March earthquake in Japan which resulted in Fab downtime, supply constraints and increased requirements for non-captive supply. All additional downward pressures on gross margins. Rather remarkably, in the recent Q1 conference call (post earthquake) SanDisk raised yearly guidance for total gross margins to 41% to 44%. This post will look at the headwinds. The next post, the tailwinds. 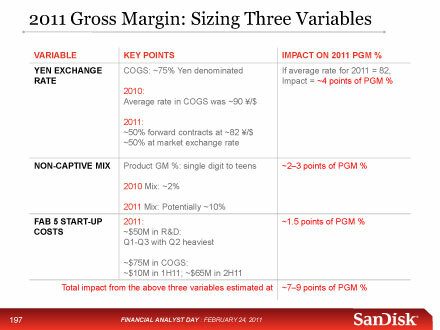 At this year’s analyst day in February, SanDisk’s CFO Judy Brunner spent quite a bit of time describing the three variables pressuring gross margins. 75% of SanDisk’s cost of sales is denominated in the Yen. In 2010 SanDisk had an average Yen to Dollar rate in its cost of sales of about 90 Yen to the dollar. For 2011 SanDisk has engaged in a strategy to lock in about 50% of the wafer purchases that it expects to buy from the Toshiba/SanDisk JV across the year. SanDisk has done this with forward contracts. SanDisk locked these in during the fourth quarter of 2010 at an average rate of about 82 Yen to the dollar. SanDisk did this to limit volatility in managing its performance in 2011. The other 50% of wafer purchases will vary with the market in terms of market exchange rates. Assuming that SanDisk achieves about 82 Yen to the dollar for all of its wafers, including the half that isn’t locked in, the impact of the Yen to the dollar, of 82 instead of approximately 90 is about 4 points of gross margin downward in 2011 vs 2010. The second factor is non-captive mix. SanDisk expects to expand its non-captive mix in 2011. This makes sense for a few reasons. One is that this still allows SanDisk to bring real dollars to the bottom line- to net income and to EPS- despite the fact that non-captive costs SanDisk more than does captive supply, and thus has lower gross margins. It also allows SanDisk maintain share with important customers and channels. And it allows SanDisk to manage its captive supply growth in a prudent way to minimize risk, and mitigate risk within its business. 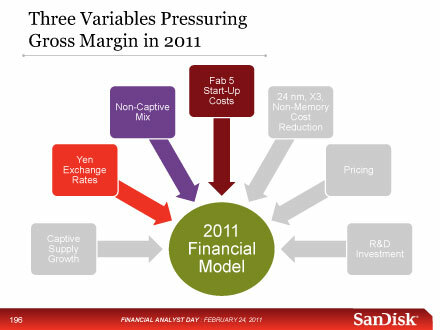 In 2010 SanDisk only purchased non-captive supply in the second half of the year and primarily in Q4. SanDisk only had about a 2% non-captive supply mix for the full year. In 2011 SanDisk is estimating that it will have a mix of up to 10% non-captive supply. And that the difference from 2% to 10% will have an impact of about 2 to 3 points of product gross margin percentage. The non-captive supply will still deliver positive product gross margin dollars, but at a lower percent, because generally non-captive supply produces product gross margin in the single digits or the teens. The third factor is Fab 5 start-up costs. Every new fab has initial start-up costs. Fab 5 is no exception. These will impact SanDisk in 2011. SanDisk estimates that it will record about $50M in start-up costs in its R&D expense primarily in Q1 through Q3, with the heaviest period being in Q2. Also, SanDisk estimates about $75 million in cost of sales- with the majority of that spending, or cost, being in the second half of the year. So if one takes just the amount that is going into cost of sales, approximately $75 million, that is approximately 1.5 points of gross margin. At Analyst Day, these three factors, added together, were expected to pull down product gross margins 7 to 9 points in 2011 vs 2010. Today the earthquake also needs to be added to the downward pressures. On March 11, Japan suffered a major earthquake and a series of significant follow-on events. Fortunately for SanDisk its joint-venture wafer fabs in Yokkaichi were relatively unaffected as they are approximately 500 miles from the quake’s epicenter. The earthquake halted normal fab operations for less than a day. The fabs have not been subject to rolling power outages or blackouts. SanDisk and Toshiba have been working with business partners in Japan to minimize the impact to NAND flash wafer production. SanDisk has dodged a bullet. If Fab 5 had been located in northeastern Japan, in Kitakami City in the Iwate Prefecture, as once contemplated, the situation would be far, far worse. As it is, there has still been collateral damage. While there are no immediate constraints of key materials, SanDisk did suffer a modest loss of supply due to the downtime from power outages. In addition, SanDisk expects some earthquake related delays in tool deliveries from certain suppliers in Japan that will reduce its expected 2011 mid-80% captive bit supply growth. SanDisk quantified the direct damage at $25 million, or 2 points of product gross margin in Q1. This includes the cost of scrapped wafers, fixed costs associated with lost wafer output, and costs to bring the fabs back on-line. In addition, for the second quarter, SanDisk’s captive memory supply has been reduced by the fab downtime in Q1, and SanDisk does not believe it can fully make up the shortfall with non-captive supply due to lead-time constraints and mix considerations. Yen exchange rates, non-captive mix and Fab 5 start-up costs all look as challenging today as they did at SanDisk’s February Analyst Day. The Yen is current trading at 80.62 to the dollar. 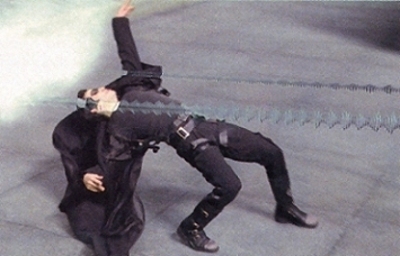 How the exchange rate will play out for the rest of the year is anyone’s guess. 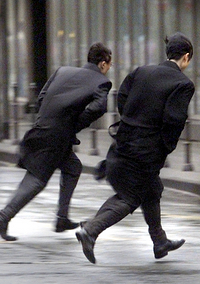 Many believe that Japan will loosen monetary policy to help the country recover. On the other side of the equation the Federal Reserve seems intent on printing ever more dollars in an attempt to resuscitate U.S. economic growth. Fab 5 start-up costs haven’t changed. If this weren’t enough, SanDisk is currently supply constrained even with non-captive supply. Headwinds haven’t let up, if anything they’ve picked up for 2011. Faced with these challenges, on what basis could notoriously conservative SanDisk, confidently increase guidance? While SanDisk’s not spelling it out, there are lots of hints as to what these tailwinds might be. That discussion will have to wait until next time. This entry was posted on Sunday, May 8th, 2011 at 3:27 pm and is filed under Uncategorized. You can follow any responses to this entry through the RSS 2.0 feed. You can leave a response, or trackback from your own site. Thanks, Savo, nice post. SanDisk indeed dodged a bullet with the earthquake(s) in Japan. Margin pressures aside, one shudders to think what would have happened (to 2011 revenues and SNDK stock price) if the Sanshiba fabs had suffered serious damage. Well said Savo. Look forward to the “tailwinds” article. They seem far stronger than the headwinds at this point. besides a very powerful pricing due to supply constraints, I wonder if one of your thesis will mention the relationship Sandisk has with Apple…. Apple probably also made sure it would get all the Nand it needs after the earthquake. Taking into account the so-so current relationship with Samsung, could it be that they bought in advance from other manufacturers ? Nice article. I wonder if Eli is realy taken a break or is busy (as always) on other schema’s. Look forward to the tailwind article.